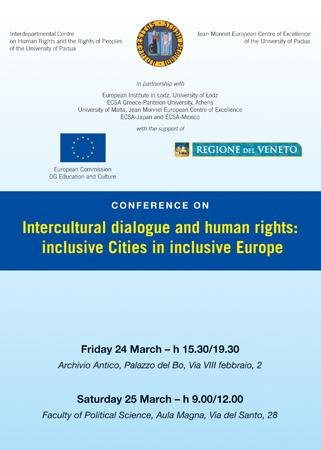 The Conference is organised in the framework of the Transnational Research Project on “The role of intercultural dialogue for the development of a new (plural, democratic) citizenship”, promoted by a network of Jean Monnet Chairs, National ECSA Associations and Jean Monnet Centres of Excellence. The Project is co-financed by the European Commission, the DG Education and Culture, Unit A2: Higher Education: Socrates-Erasmus, Jean Monnet Action, and by the Region of Veneto. Antonio Papisca (University of Padua), Marco Mascia (University of Padua), Peter Balazs (University of Budapest), Paola Degani (University of Padua), Giampiero Griffo (Disabled Peoples’ International), Kumiko Haba (Hosei University, Tokyo, ECSA-Japan), Renata Lupone (University of Florence), Bruno Paccagnella (University of Padua), Stelios Perrakis (Panteion University, Athens), Rosa Maria Pinon (University of Mexico, ECSA-Mexico), Enzo Pace (University of Padua), Alessandro Preti (Director, NGO “Un Ponte per”, Italy), Gianfranco Tusset (University of Padua), Stefano Valenti (Council of Europe). Maria Karasinska-Fendler (European Institute in Łodz, University of Łodz), Enrique Banus (University of Navarra), Leonce Bekemans (Poland University in Czestochowa), Anna Jedrzejewska (European Institute in Łodz), Stanislas Konopacki (University of Łodz), Kazimerz Sobotka (European Institute in Łodz, University of Łodz), Johannes Thomas (University of Paderborn). Constantine Stephanou (Panteion University, Athens, ECSA-Greece), Dario Castiglione (University of Exeter), Dimitris Chryssochoou (University of Exeter), Francesca Longo (University of Catania), Krassimir Nikolov (Bulgarian European Community Studies Association), Iro Stephanou (Panteion University, Athens), Michael Tzinissizelis. Peter G. Xuereb (University of Malta), Neila Akrimi (Université de Tunis), Imed Frikha (University of Sfax), Deniz Ilgaz (Bogazici University), Erwan Lannon (University of Ghent), Fatiha Sahli (University of Cady Ayyad, Morocco).